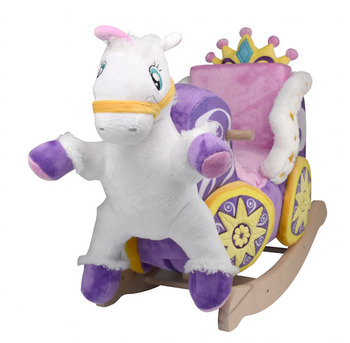 Allow your little one to take role-playing to the next level with The Royal Horse and Carriage Rocker. It’s the stuff of fairy tales: the perfect marriage of play and education with four push buttons located on the carriage that activate catchy songs that teach ABCs, numbers, colors, and more. More thoughtful features: Both horse and the pink carriage lining that doubles as a snuggy blanket are attached with Velcro and can be removed for play, for nap time, or for a trip to the wash! With personalization (11 character limit), one of the wood rails will first be engraved and then painted for a beautiful look. Click More Images above for color choices and more images. Made and sourced with pride in the USA, including hardwood, stuffing, production, assembly, packaging - fabric skin and music box are imported. Approximate measurements 24”L x 12”W x 17”H. For ages 9 months and over. 80 pounds maximum.